When it comes to high-end compact cameras there are lots of options out there. Most of those, however, happen to cost a pretty penny. Although the Nikon Coolpix P340 couldn't be called "budget" it does undercut many of its competitors on the price front and yet still offers a solid feature set to lure in keen photographers. Yes, the P340 is barely any different from its P330 predecessor - it adds Wi-Fi and some other minor tweaks - but it's a solid slice of compact camera complete with the larger-than-standard sensor size and 24-120mm f/1.8-5.6 equivalent zoom lens. If it's small, pocketable, advanced yet affordable that you're after then Nikon may well have cracked it in the P340. Or does it still fail to stand head and shoulders above its competitors? We've been shooting with the "Performance" Coolpix to see whether it's the hot stuff we've been waiting for or still a step behind where it could be. The point of a compact, for many, is inherent in the very name: to be compact. Given the Coolpix P340's 103 x 58 x 32mm dimensions it achieves this, albeit in somewhat blocky fashion. It's a rectangular slab of a camera, with a small vertical grip to the front that, combined, manages to pull off its design aesthetic with success. We've got the black finish in the office, which we prefer to the white option that's also available. What really positions the P340 in its advanced group is the physical lens ring that protrudes from the body and from which the lens extends when the camera is switched on. We're big fans of physical controls on compact cameras, and this Coolpix's rotate-and-click front ring feels great to use. However, those clicks don't always register at pace. When using the lens ring to jump between aperture values, for example, a quicker rotation - with the hope of dropping from, say, f/2.8 to f/8.0 - often only registers two f-stops or so. It's feels as though the software is somewhat behind the physical input. The same can be said of the camera's menu operation on the whole. It's something we cited with the earlier P330 model and, despite some background work that's gone into the latest P340, it still lacks that absolute immediacy that we would expect from a high-end camera of this type. The lens ring isn't the only physical control on board: the P340 also takes benefit of a rear thumbwheel and rear rotational d-pad. Although we're somewhat confused about the necessity for both, as by default both controls perform exactly the same function. We all but ignored the top thumbwheel as we couldn't find the option to program its function from within the menus, so it was often unwanted. Having a physical mode dial and front function button are both useful additions for a camera of this type though. The only thing lacking is a touchscreen, but the presence of one would only hike up the price. Despite slow menus, the same can't be said about the Coolpix P340's autofocus system. It's surprisingly swift. And we say surprising because when we saw the earlier P330 we weren't able to rave about it quite so much. We don't have both cameras for a side-by-side test, which is a shame, but feel content with the P340's speed. Clearly Nikon has tweaked performance behind the scenes in the latest model as there's also an option to shoot raw & JPEG without the need to wait between one shot and the next. This only works for one shot followed by a second, before the camera's buffer is too busy to accept more, but, and again, this is a vast improvement to the waiting game necessary with the earlier P330 model. When shooting the autofocus system offers a new "spot" option which uses a smaller focus area for apparent greater precision. This joins the single (normal and wide), auto (9-area), subject tracking and face priority options. However, and this was an issue with the earlier model, the autofocus accuracy can be called into question: a number of shots confirmed to be in focus were not, irrelevant of shutter speed and lighting conditions. In dimmer conditions the autofocus does slow down a noticeable amount, but this is typical of any compact. There's a built-in AF-assist lamp to illuminate subjects as necessary. One feature we particularly liked was the inclusion of a minimum shutter speed option in the menus. We selected 1/30th sec as an absolute minimum to increase the assurance of a sharp shot each time. Paired with Auto ISO it meant we often captured shots at the middling sensitivities, but as the cap is ISO 1600 - it can be more, but only when manually selected - shots remain usable enough. Macro mode is an improvement over its predecessor model too. The Nikon P340 can shoot a mere 2cms away from the lens when at its widest-angle 24mm (equivalent) setting, and while it can't muster such close-up shooting when fully extended to its 120mm (equivalent) setting it can still shoot from approximately 30cms from the lens. You will need to pop the macro mode on via a downward press of the d-pad to switch between focus options and we found shooting multiple frames to be helpful as, again, one or two weren't precision focused. When it comes to manual focus a focus assist option magnifies the screen to assist with identifying in-focus areas. In this model a focus peaking feature has been added which highlights in-focus edges with a colour (white by default) to identify that they are in focus. However it's the rear rotational d-pad that controls manual focus by default which feels a little strange - you can use the lens ring, but only by setting it up from within the menus. With the Nikon P340 comes the addition of Wi-Fi. No longer do you need to fork out extra cash for a Wi-Fi accessory, and the presence of this new feature adds naught to the overall price. We like. To use the service you'll need to download the Nikon Wireless Mobile Utility (WMU) for iOS or Android. It's a basic app, but it does the job and - best of all in our view - you needn't set up fussy passwords. Instead you can have an open network to make it easier to use a device to connect to the camera. Or if you're security cautious then you can set a complex password for the SSID connection. Within the app you can preview shots on the camera's SD card on your smart device. And download them if you want. But that is it. There's no direct sharing from the app, but that's easy to do from the smart device. At least Nikon hasn't gone down the route of complicating things or forcing its own services on users (as Panasonic does). Simple, but effective - we rather like this fashion of Wi-Fi sharing. Some more app-based tweaks, such as Facebook, Twitter and similar sharing integration and wireless remote control, and it would be a step ahead. When it comes to image quality there's no discernible difference between the P340 and the earlier P330 models. And, in general, that's a good thing. The fact that Nikon has chosen to use a 12-megapixel 1/1.7in sensor - not an over-populated 18-megapixel or higher resolution one - means there's more light available per "pixel" and that results in decent looking images. Shots might not be as physically large as some of the consumer compacts out there, but we're on side with the P340. The ISO 80-3200 range is largely devoid of aggressive image noise at the lower ISO settings, except for some more notable colour noise in shadow areas from the mid ISO sensitivities and beyond. Even so the P340 outshines something like the Panasonic Lumix LX7 at these settings, even if it can't offer as wide a maximum aperture throughout its focal range. It's the lower end of the sensitivity spectrum, at ISO 80, where shots are sharpest and most rewarding. We've snapped sharp macro shots and wide-angle scenes that look decent. In addition to raw capture there are a batch of in-camera effects, while Nikon's Active D-Lighting can boost shadow and highlight detail for more equal-exposed shots. If you want decent shots from a sensor of this size then the P340 is quite capable. Not best-in-class, but not too far behind the likes of the Canon Powershot S120. Despite it only adding Wi-Fi and a handful of speed and software improvements compared to its 2013 predecessor the Coolpix P340 adds up to a more rounded experience than before. It's a camera building from already solid foundations. Decent image quality, a fair price point and a competitive 24-120mm f/1.8-5.6 equivalent zoom lens with physical control ring ensure the Nikon is well in the high-end compact camera runnings. However its questionable autofocus accuracy and relatively slow menu system hold the P340 back from a better score. We did rather enjoy the password-free open network possibilities of the Wi-Fi sharing, although the app could be developed into something more complex than the simple smartphone sharing application it currently is. If price is a major factor in your purchase then the P340 is £100 less than the Canon PowerShot S120. It might not have the touchscreen and fuller features list, but for the sake of savings we can certainly see the Nikon appeal. 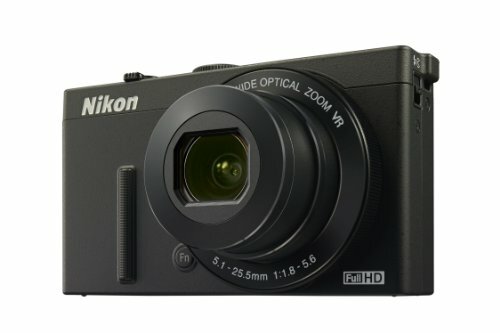 Nikon is finding its footing in the compact camera market and the Coolpix P340 is a good example of a compact camera. The Wi-Fi integration has been considered but there's still scope for the company to tweak a few performance points for it to truly excel.